So, it’s Day 2 and I’ve finished my first book. 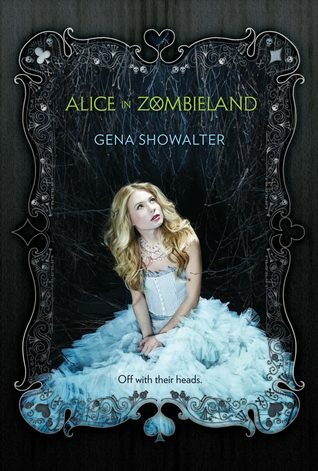 I started with Alice in Zombieland by Gena Showalter. I decided to do a zombie theme to my challenge. I enjoyed the book and moved through it fairly quickly. Alice’s father was crazy. He spent his night afraid of the monsters and his days drinking to forget them. He refused to let his family out of the house after dark, which seriously put a crimp in Alice’s social life. Unfortunately, he was also right. The night that Alice loses her entire she also loses her illusions. The monsters are real. She can finally see them, but they can see her too. In this new version of the world Alice has no one to rely on except herself. At least at first. Soon, she realizes that Cole, the baddest of the bad boys at her new school, knows something about the monsters. Something more than hormones are drawing her to him. But does she really want to be involved with a guy from the wrong side of the lockers on top of everything else? So, in many ways, this was a pretty typical YA, paranormal romance. The girl has faced tragedy that only the hot, but illusive guy can understand. Hot, but illusive guy may be worse for her than the original tragedy and is it worth the risk? Girl is extra special. Ok, fair enough. They’re tropes because they work. I’ll absolutely read the second book when it comes out. Two things, however, threw me a little. #1 – The book is set in my hometown. I spent a ton of time trying to place it in the city. But despite saying specifically that it’s all happening in Birmingham, AL there isn’t any other geographical information given. Birmingham is a pretty big city, so there are lots of places within the city that everything could be happening. It’s not something that would affect most readers. I’m special. Just like Alice. The author also made up the two high schools mentioned in the book. Totally fair. She needed them to be up to her specifications. I get it. But added to my sense of disorientation. I think I would have felt a little more settled if it had been in an unnamed town outside of Birmingham rather than specifically anchored in the city itself. #2 – The monsters are called zombies. But… they’re NOT! At least, not to my zombie-loving heart. I’ve read a LOT of zombie books. I’ve had chemical weapon induced zombies, voodoo zombies, zombies created by a cure for the common cold, and zombies with no explanation. I’ve had magic zombies and science zombies. But I’m not sure I can cope with incorporeal zombies. They’re just… I don’t think I can do it. They don’t eat the flesh of the living. They don’t shamble. They’re rotting, so that’s something. But… Ok, when I was younger my Mom couldn’t afford name brand stuff for me. So we drank Diet Rite instead of Diet Coke and I had knock off Keds. As zombies, these monsters had that faint aftertaste of the wrong artificial flavors. I had to teach my brain to see monsters instead of zombies so I wouldn’t pout. They’re awesome, scary monsters. They’re just not zombies.